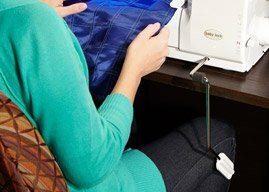 When impossible does not exist, you'll know you're using a Baby Lock serger. Baby Lock was the first to introduce the world to sergers with easy air threading and no tension knobs. 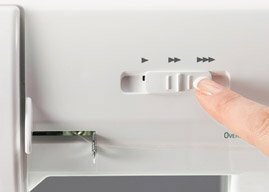 Now, the Baby Lock Ovation eight-thread serger brings you the largest workspace in the home serger industry. 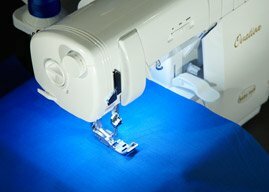 The Ovation has other innovative features like a knee lift and six bright LED lights to make every sewing project easier. Plus, you get 87 stitch combinations including the Baby Lock Exclusive Wave Stitch. The Ovation steps into a new realm of serging. From home decor to garments, it's time for an outstanding performance. Knee lifter ~ Keep your hands free for more precision as you serge. Pure lighting - 6 led lights ~ Clearly see every stitch, fabric and thread color under six bright LED lights. Largest Throat Space - 5" to Right of Needle ~ Easily serge large projects with room to spare. You'll love adding decorative stitching to yards and yards of fabric. Convenient Presser Foot Lever ~ An easy-access presser foot lever in the front of the machine lets you quickly make adjustments. Variable Speed Control ~ Always stitch at a comfortable pace for the utmost precision. ExtraordinAir Threading System™ ~ Thread your loopers all at once with the push of a button. A quick gust of air gets your thread through each looper with minimal effort. Baby Lock is known for easy, innovative sergers. It was first company to present sergers to the home sewer and now has 14 patented features to its name. So what did the company do to make a lasting impression with the new Baby Lock Ovation? It went bigger. 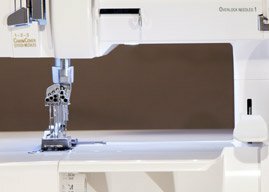 The new Ovation serger has five inches to the right of the needle—that’s more space than any other serger in the home sewing industry. This large area is ideal for embellishing fabric with decorative cover stitching. Additionally, the space makes it easier to serge large projects. The surface is illuminated by six bright LED lights—Baby Lock’s Pure Lighting lets the user clearly see every stitch and detail while serging. 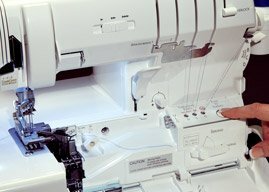 The new Ovation eight-thread serger also comes complete with Baby Lock patented features. It has one-touch ExtraordinAir™ Threading so users can thread all the loopers with the push of a button. And the Automatic Thread Delivery System (ATD) lets users thread in any order for a perfectly balanced stitch on any fabric with any type of thread. The user never has to worry about tension adjustments. The Ovation automatically adjusts the tensions according to the type of fabric and stitch being used. In addition to Baby Lock signature features, the Baby Lock Ovation comes with new conveniences such as a highly requested knee lift. Users can keep both hands on their projects as a simple move of the knee raises or drops the presser foot. This is especially convenient for people who regularly use the knee lift on their sewing machines. Another handy new feature is the speed control function. 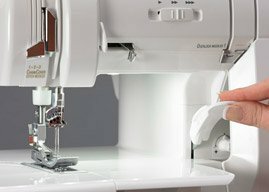 Users can choose their maximum comfortable speed for extra sewing precision. Even seemingly small features were improved upon. For instance, the Baby Lock Ovation has moved the hand presser foot lift to the front of the machine unlike many machines that have it at the back. This saves the user time and effort of reaching around their machine to perform this simple function. There are a number of these hassle-reducing features on the Ovation. One is the magnetic needle drop tray, which ensures needles won’t get lost in the machine when dropped. There’s also a new needle clamp guard so the tiny needle screws do not fall out when needles need changing.